The minister explained that many play rugby while in school but few continue through to a national level. This was because of injuries sustained while at school and they are forced to play without proper medical attention. The Ministry, together with the Sports Medicine Unit, hopes to have in place a health safety policy for rugby in Sri Lanka. Professor Arjuna de Silva, explaining the guidelines, said that there have been no life-threatening problems but that the incidence of injuries can be reduced by having a proper safety policy. The Sri Lanka Rugby Football Union is committed to bringing success to the minister’s hopes. However, work has to begin at schools. The question for me was whether this was like playing Hamlet with the Prince of Denmark, in this case the Sri Lanka Schools Rugby Football Association, not being present. When asked about this; the Minister said that there is a commitment from the Education Ministry and the Deputy Director General of Sports was present. He went on to explain that a joint cabinet paper is being presented by the Ministers of Education and Sport giving a place for governing bodies for sports to have an amalgamated effort in the future. The objective is for the Sports Ministry as well as the schools together with the Ministry of Education to work towards the betterment of the sport. The professor explained the need for a process that will be beneficial to the sport as well as children. The process is to cover medical treatment, training, grounds, practice games and referees as well as coaching personnel. The guidelines expect a medical check for suitability as well as a check to avoid age imbalance. The bigger problem as explained was the need to improve the knowledge of the coaching and administrative staff in the management and improvement of sports. The guidelines which cover the clubs also are using the schools as a starter. Issues that were of concern were improper injury management, which includes concussion management. It was emphasised that a player with a head injury has to have a gradual return to play. The problem that has to be faced is because the game has many stakeholders, who want to win games and will push a player to return. 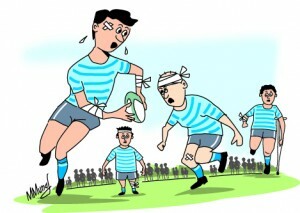 It was last week that one of those well-meaning advisory types told me, “What we want is to win a game and what would you expect a coach to do?” In terms of the IRB player welfare guidelines all coaches as well as referees are expected to have done the first aid course as this can help in the event of an injury. It is good when players too know what has to be done in the case of injury. What surprises me is when smart comments are made that the coach should be told by the players that we have come to play rugby and not learn first aid. Professor Silva when asked about supplements said that according to information, two leading schools are spending 14 to 16 million rupees for a single season of rugby, of which Rs. 2 to 3 million are for supplements. He went on to say that this is not good for school players. Medical advice is that schools players (kids) should not be given supplements. If there is a serious need they should be given after proper medical advice and followed up. In the case of adult players there may be a need but this too should be scientifically administered. Having listened to parents and well wishers lamenting that boys must be given supplements as they must stay with the times and what is being done around them, I am certain junior players can do without some of these advisors. The future is of little concern and anything is all right to some parents if their son can be in the team. Similarly, we find parasites around us who come in the guise of loyal Old Boys, who believe that anything is good for a win. Asked about this, the Minister explained that it will be a step by step approach and parents and well wishers too will be educated as the IRB has informative material and certifications on player welfare. The task is not easy and has to be done as those around seem not to have understood the consequences. Rugby being a contact sport, immunization against Hepatitis B as well as Chicken Pox should be provided as this will help prevent the spread of disease and infection. The clause that coaches must educate players on the laws of the game as well as the tournament rules itself is welcome but paradoxical as it is they that first break all the rules inside the playing enclosure. The menace of supplements leading to the use of banned substances has been a problem to sport in recent times .This has embarrassed rugby internationally and we have been lucky to be left off the hook. Luck will not help us if the problem is recurrent. The Minister declared that new legislature will be presented in Parliament within three months. This will enable a life ban to be imposed on drug takers and jail terms to be given to trainers in charge of leading players who take banned substances. If a doctor is found guilty of recommending the drug he too will have a place in jail.